This truly amazing salt is mined from a rock salt deposit in the Himalayas. The salt crystals appear black in color, and are ground to a fine powder which is not black, but pinkish grey in color. The crystal salt contains a wealth of cell utilizable minerals and trace elements, such as sodium, potassium, iron, calcium and magnesium, which are essential for efficient cell metabolism. It is a rejuvenator and an ancient Ayurvedic anti-aging secret. This Himalayan BLACK salt has the benefits of pink Himalayan salt, but, with the addition of being rich in sulfur, it does more for optimal health. It is well documented that enough sulfur can make a difference for arthritis, allergies, asthma, cancer prevention, diabetes, digestive disorders, cramps and snoring. The "beauty mineral" sulfur aids gum, hair and skin health. This nutrient is anti-inflammatory, supports cell repair, and is needed by the liver to detoxify harmful chemicals. The Happy Children's Salt is especially appreciated in dishes that mimic the taste of eggs. Try sprinkling some onto an avocado half and see how much it tastes like you're eating a boiled egg. It is also nice in a cashew cream sauce or on veggies, fruits and grain dishes. THE TASTE OF THIS SALT CAN GROW ON YOU AND MAKE IT YOUR ABSOLUTE FAVORITE. If the salt is cooked, most of the sulfur taste will disappear. Sulfur stays but the gas form (hydrogen sulfide) that gives it the "eggy" aroma diffuses into the air and disappears from the dish. This means you can use the salt for a great variety of dishes and get the benefit of the sulfur without compromising the flavor of your dish. Our salt has the best possible quality. 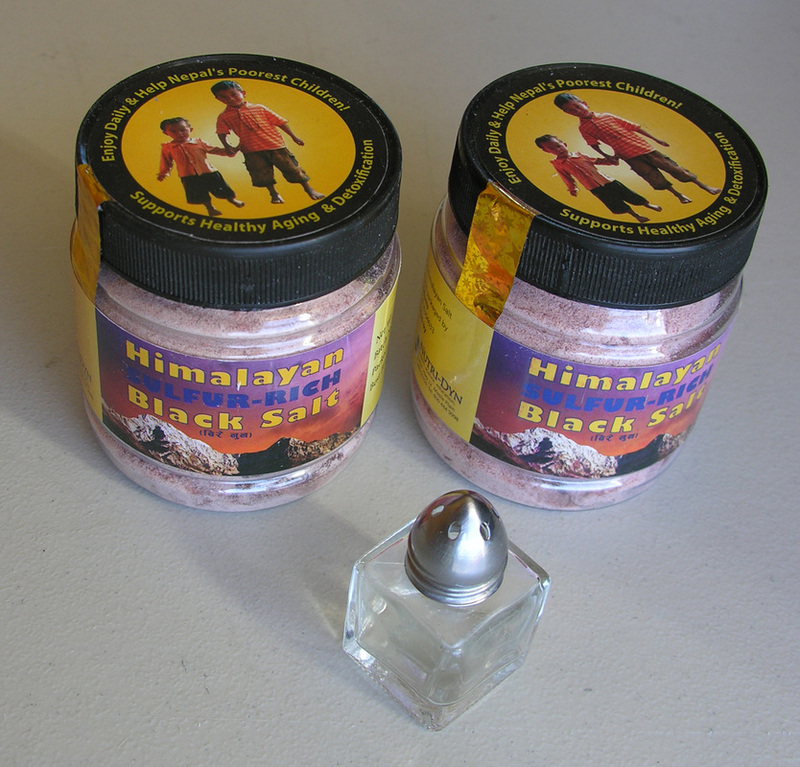 It is 100% natural, wholesome, traditional Himalayan Ayurvedic healing black salt rock. It is hand-cleaned and crushed using NON-PAINTED stainless steel tools, in a Nepali-government approved facility DEDICATED TO THIS SALT ONLY. NO CHEMICAL processing or refining! NO HEATING or COOKING! Just the naturally sulfur-rich black crystals, MINED AT THE UN-POLLUTED HIMALAYAS, NOTHING ALTERED OR ADDED -- an amazing high quality product. Our Himalayan black salt is special, because it supports a network of Nepali schools, community & child care centers, and orphanages. This project of Nepali Schools is important in order to prevent child trafficking, slavery and prostitution by providing holistic education and protection for disadvantaged children in rural villages. The salt production brings jobs to the Nepali people from processing to bottling and labeling. No sweat shops involved. ﻿We are a ONE world community! AN AMAZING GIFT FROM NATURE! Disclaimer: The salt is a food item. We do not claim to prevent, heal or cure any medical condition. healing salt, sulfur-rich, the beauty mineral, crucial for detoxification, cell repair, antiaging, anti-inflammatory. Great for arthritis, allergies, asthma, liver. Phase 2 in liver.